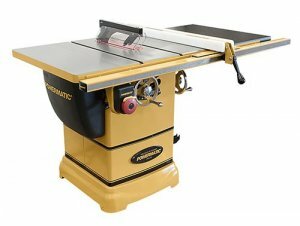 Many home woodworkers dream of having a full-size cabinet saw in their garage converted workshop, but how many garages are wired to meet the 230V demand that most cabinet saws require? Enter the new Powermatic PM1000, a true cabinet-saw that requires only a standard 115V outlet. The PM1000 has evolved from and is very similar to the popular PM2000. In fact, many of the specifications of the two saws are very similar. The biggest difference, is of course, the lower 1-3/4 HP single-phase induction motor that drives the PM1000; compared to 3 HP on the PM2000. Like the PM2000, the PM1000 uses Poly-V drive belts that are said to reduce vibration and slippage, which in turn last longer. The body of the saw is completely enclosed and incorporates a 4-inch dust port and offers a hinged motor cover at allow for easy cleaning and access. The 10" PM1000 Cabinet Saw will be available in two models: the #1791000K ($1,999.99) with cast iron tabletop and a 30" maximum rip capacity to the right of the blade, and the #1791001K model ($2,099.99) with cast iron top and extension table with 52" rip capacity to the right.